FAQ Friday – How does the Idaho Department of Labor recover money from illegal claims? People who claim benefits when they aren’t eligible are required to repay any and all overpayments in full, with a penalty assessed if the overpayment was due to fraud. The department is very aggressive about collecting overpayments. If the claimant is employed, the department will garnish their wages. Yes – this means their new employers will discover they owe us money. Other steps include garnishing the spouse’s wages, filing an administrative lien on personal property such as vehicles or private property, and seizing bank accounts and tax refunds. Collection activity is a lot of work, but worth the investment. Allowing improperly paid benefits to stay uncollected isn’t fair to the many unemployed people who play by the rules. Collection efforts also help prevent employers from paying unnecessary taxes for benefits. Bottom line: Collecting benefits when you shouldn’t isn’t worth the pain of having to pay them back ─ with penalties and interest. This entry was posted in FAQ Friday, Unemployment Insurance and tagged employer perspective, FAQs, idaho, idaho employers, insurance benefits, unemployment benefit, unemployment benefits, unemployment insurance, who really pays on September 21, 2012 by Idaho Department of Labor. These days there are lots of tools to choose from when considering a new career. 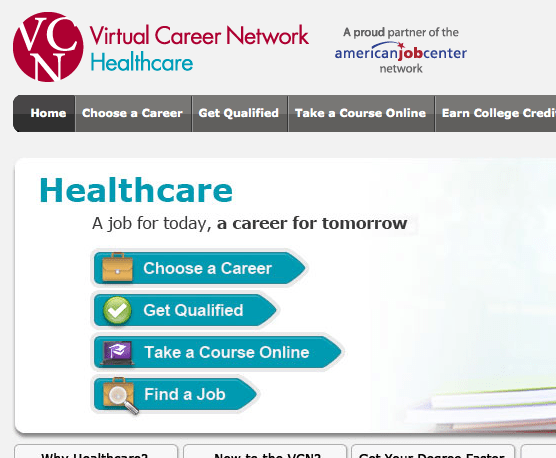 New this year, the Healthcare Virtual Career Network provides career exploration and training tools to help job seekers prepare for careers in healthcare. Job seekers can explore healthcare careers, identify education and training programs, access online courses, get credit for prior learning, and search for local healthcare jobs. Idaho’s Career Information System (click on Guests for the free version) has added or improved several new information files including About Programs of Study, About Schools (also available in Spanish) and Financial Aid Sort. All of these pages contain Idaho-specific information and are designed to help students make wiser choices about what schools can help them reach their career goals. Life After High School is a tool designed to help younger students learn that training beyond high school is appropriate, sensible and affordable. Workshops on how to use this system are held throughout the state each fall and are for anyone who works with or helps students or clients develop career plans. Click here to find the workshop closest to your area. The Worker Reemployment Portal is designed to assist impacted workers following job loss and to connect them to resources for training, reemployment, career planning, financial and emotional help during the process of job transition. The site also now includes a job search by location feature. CareerOneStop helps job seekers explore careers, investigate salary and benefit information, research education and training opportunities, plan a job search, browse job sites, write and improve resumes and cover letters, prepare for a job interview and search for jobs. The site’s new Certification Finder houses information on thousands of certifications and allows users to search for certifications by industry, occupation, or keyword. A new feature includes icons that highlight certifications that have been recognized, endorsed, or accredited by third-party organizations. This entry was posted in Job Seekers, Students and tagged careers, college readiness, education, idaho, idaho career information system, idaho careers, job search, jobs, my skills my future, reemployment, USDOL, veterans, workforce training on September 18, 2012 by Idaho Department of Labor. FAQ Friday – How can someone be working and still collect unemployment insurance? A: That’s right – if you are working reduced hours, you may be able to still potentially collect unemployment insurance benefits, depending on how much you earn. How much you can earn and still collect benefits depends on two things: 1) your unemployment benefit amount and 2) how much money you earn. Let’s figure it out. First, multiply your weekly benefit amount by 1.5. Keep this magic number handy. Next, calculate how much you earned that week – Sunday through Saturday. Here is the important part – use gross wages (before taxes) for the week you work, even if you don’t get paid until later. Don’t fudge this number! If you can’t get the exact amount, use an estimate or get help from your employer and then call us when you get it. Incorrect earnings will be discovered during an audit and could result in fraud. Next, let’s calculate your weekly unemployment payment. Are your earnings more than the magic number (weekly benefit amount times 1.5). If so, you earned too much to receive unemployment insurance benefits for the week. If not, subtract your earnings from the magic number. If the amount left is over your regular benefit amount, you may receive your full payment. If it is less, that is the amount you receive in partial benefits. The money you don’t receive that week stays in your account, potentially extending your benefits. And like other claimants, you still need to look for and accept other work opportunities even though you are working part time. TIP: Report your earnings, even if you know you are still going to get a full payment. Also, earnings don’t have to be from an employer. They could be cash for fixing a friend’s car, room and board in exchange for housekeeping, self-employment or compensation from the National Guard or Reserve. This entry was posted in FAQ Friday, Unemployment Insurance and tagged time tip, unemployment benefit, unemployment insurance benefits on September 7, 2012 by Idaho Department of Labor.